Hillary Clinton said that if elected president, she would push plans to get every household in America powered by renewable energy by 2027. 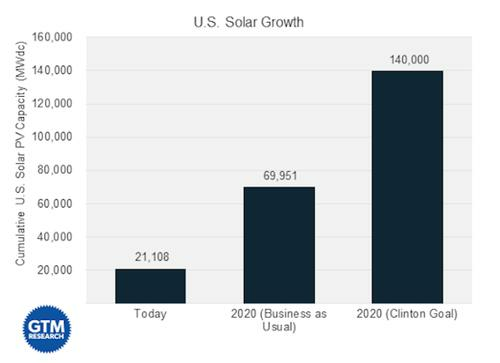 The current growth of solar energy compared with Hillary Clinton's proposed growth plan. While those goals may sound overly ambitious, experts said they're not. Clinton's plan would boost wind, solar, and other renewables so that they'd provide 33% of America's electricity by 2027. The proposal includes increasing U.S. installed solar capacity from 21 gigawatts (GW) today to 140GW by the end of 2020 -- a seven-fold increase. "Over the next few months I'll lay out a comprehensive agenda to meet the climate challenge and make America the clean energy superpower," Clinton said. "We're on the cusp of a new era." "In short, yes, but with a few caveats," Shayle Kann, senior vice president at GTM Research, wrote in a response after Clinton's announcement. Clinton's target can be reached if the U.S. solar market grows at an annual rate of 32% from 2017-2020. But that will happen only do that if current tax incentives remains in place -- they're currently scheduled to expire -- and if other programs set in place by the Obama administration continue without being cut. Clinton's renewable policy plans are part of a larger effort to fight climate change. Most other presidential candidates have yet to announce concrete plans for increasing renewable energy capacity. One that has is former Maryland governor and Democratic contender Martin O'Malley, who called for the end of fossil fuel use and a full clean energy economy by 2050. America, O'Malley said last month, "should be 100% powered by clean energy, supported by millions of new jobs." "I would set a national, cross-sector Renewable Electricity Standard so our nation is powered by 100% clean energy by 2050, and a national goal of doubling energy efficiency within 15 years," O'Malley said. "Many states like California and Maryland are already leading the way forward for the United States." Although solar growth has historically been concentrated in rooftop panels, the U.S. Energy Information Administration (EIA) expects utility-scale solar capacity will increase by 90% by the end of 2016, with more than half of this new capacity being built in California. Clinton's main Democratic rival at the moment, Sen. Bernie Sanders, a Vermont Independent, has not yet released his renewable energy plans. Today, the U.S. gets only about 0.4% of its power from photovoltaic (solar) power installations. Traditional power generation still provides 85% of the country's energy needs: 39% comes from coal, 27% from natural gas and 19% from nuclear, according to the EIA. Almost all the rest of power in the U.S. is generated from renewable sources, such as hydroelectric (6%), wind turbines (4.4%), biomass (1.7%) and geothermal (0.4%). Remarkably, providing for all of the power needs in the U.S. would require a relatively small amount of real estate. According to a 2008 analysis by the National Renewable Energy Laboratory, supplying those needs with photovoltaic solar energy would require that roughly 0.6% of the country's land area be covered by solar panels -- about 1,948 square feet per person. New installations of solar power capacity are already growing at consistently high double-digit rates. So far this year, solar installations surpassed those of wind and coal for the second year in a row, accounting for 32% of all new electrical capacity, according to a report released earlier this year by GTM and the SEIA. "Hillary Clinton's 33% installation target is double [considering] what the government is currently forecasting," said Raj Prabhu, CEO of Mercom Capital Group, a clean energy research firm. Clinton's target of 140GW of total capacity can be reached if the U.S. solar market grows at an annual rate of 32% from 2017-2020. That's roughly on par with the 36% annual growth rate GTM projected from 2013-2016. "In other words, the market just needs to keep growing at the same rate for another four years," Kann stated. "But that won't happen under business-as-usual conditions, hence the big difference between our 2020 forecast and Clinton's goal." With no changes to the nation's policies, solar capacity would only grow to about 70GW by 2020, according to GTM Research. That's because under current policies, tax incentives and other growth programs are set to expire next year. For example, the federal government's solar investment tax credit (ITC), which offers a 30% tax credit for residential and business installations, will run out next year and drop to a more permanent 10%. The main catalyst of growth in solar installations in the U.S. has been the 30% ITC, Prabhu said. Forecasts indicate a decline in the solar growth rate in 2017 "assuming there are no miracles to save the ITC from expiration." "Looking at the current scenario, a 700% forecasted growth by 2020 looks overly aggressive," Prabhu said of Clinton's plan. Considering the current expiration of the ITC, Kann also characterized Clinton's goal as a "highly aggressive goal" and one that would require a new set of policy drivers and incentives, especially considering she wouldn't take office until 2017. Another challenge Clinton would have as president would be her limited influence over local utility markets and how utilities companies treat their solar customers. Currently, residential solar is economically viable due to net metering policies, which force utilities to buy back any excess power generated by rooftop solar installations. However, some utilities are moving away from that rate structure, and are instead charging solar customers a monthly fixed charge; that effectively raises the cost of solar power and dis-incentivizes roof-top solar systems, according to Mark Barineau, an analyst with Lux Research. Currently, 43 states and the District of Columbia have implemented net metering policies, some of which are more favorable than others. All turn the power grid into a two-way street. Many states, such as Arizona, California, Hawaii, Idaho, Ohio, New Mexico, Louisiana, and Wisconsin, are discussing or have passed revisions to their net metering policies that would included fixed monthly surcharges for residences and businesses that install solar to make it less competitive with conventional forms energy. Barineau said utilities would still need to have back-up generation available and on standby to respond to grid issues or a lack of sunlight. "For wide-scale deployment of solar to power the homes in America, a significant amount of energy storage -- most likely, batteries -- would be required, and at the moment, the economics are not quite there to support the proposed solar deployment," Barineau said. All-electric car maker Tesla and others have been ramping up efforts to boost the amount of battery systems for businesses and homes. In the end, Clinton would be challenged to reinstate the ITC, spur new renewable incentives and affect change at the state and local level in order to make her renewable dreams a reality. "Anything is possible, but is it realistic? At this point, it looks more like a typical campaign goal to energize the donors and the base," Prabhu said.